As you all know, during last years’ Labour Day weekend we marked the beginning of our new union, Unifor, following the long awaited merger of the Canadian Auto Workers Union (CAW) and the Communications, Energy and Paperworkers Union of Canada (CEP). Unifor is the largest private sector union in Canada representing more than 305,000 workers in some 20 economic sectors. It is only fitting that with the introduction of our new union, we introduce a new re-designed publication that will replace the long-time CAW Railfax. The new Unifor RailLINE will continue to be an issues-based publication that will provide current information to Unifor members working in the rail transportation sector, as well as the general public. The very first Railfax was issued on September 15, 1994 and was titled: “CAW Applies for AMF Certification.” For almost 19-years, Railfax was the document to look for when important news and information was to be reported in CAW Rail. 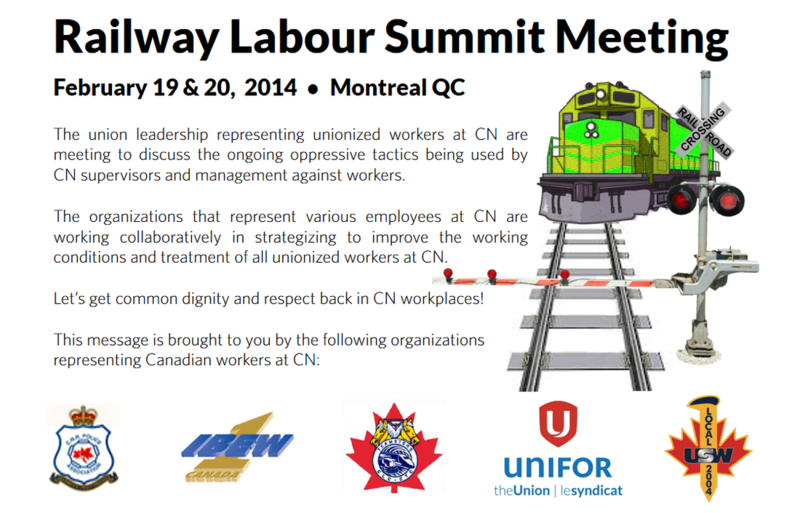 And RailLINE will continue with that tradition within Unifor Rail. Our new national union sees new names for our Rail Locals; Unifor National Council 4000, Unifor Local 100, Unifor Local 101-R and Unifor Local 103. Unifor’s new national leadership team is National President Jerry Dias, National Secretary Treasurer Peter Kennedy and Quebec Director Michel Ouimet. The National Executive Board is made up of 11 Industry Council Representatives, with Heather Grant, Secretary Treasurer of Unifor Council 4000, representing the Transportation Sector. And Unifor has a new Director for Rail. National Representative Brian Stevens was recently appointed to this new position. Brother Stevens, along with National Representative Brother Bob Fitzgerald service Unifor Rail members at CN, CP, Ontario Northland, VIA Rail and a number of regional railways across the country. The four Local Unifor Rail Presidents, Ken Hiatt, Brian Kelly, Barry Kennedy and Tom Murphy, are working with national staff on establishing a new Industry Council for Rail by this summer. We hope you like our new RailLINE. You can access all future issues of Unifor RailLINE on the Homepage of unifor4000.com at the "Bulletin Board" section.